There is various gases law you have to study in Thermodynamics. The gas is the term applied in engineering to the state of any substance of which the evaporation from the liquid state is complete. Examples are Air, Oxygen, and Nitrogen etc. 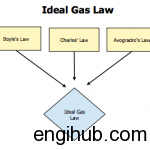 So, here you will get details about Perfect Gases Law. Vapour may be defined as a partially Evaporated Liquid. Hence it consists of the pure gaseous state together with the particles of liquid in suspension. “Superheating” is the process where Dry Vapor is heated further. This Superheated Vapors approximately behaves like a gas. An example of vapours used for engineering purpose is wet steam, ammonia etc. 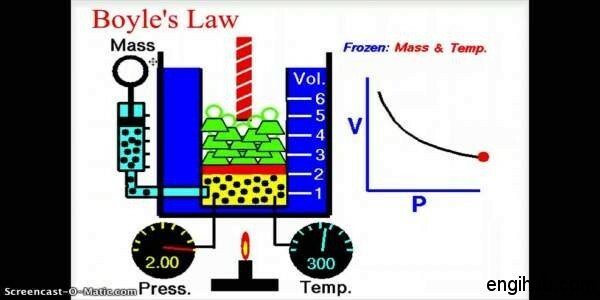 A perfect gas or an idle gas is one which strictly obeys all gas laws under all conditions of temperature and also pressures. Actually, no gas known is perfect but within the temperature limits of applied thermodynamics, many gases like hydrogen, oxygen and even air may be regarded as a perfect gas. The Pressure (p) exerted by the Gas, the Volume (v) occupied by it and also its Temperature (T) are three variables control the Physical properties of a gas. Anyone variable can be calculated by applying the Gas Law if other two variables are given. But these are not applicable for Vapors. This law states that “The volume of a given mass of a gas varies inversely as its absolute pressure, provided the temperature remains constant”. The deviation can be overlooked in the case of Air, Hydrogen. And also Nitrogen etc. expect at a very low temperature or at very high Pressure. This states that “The volume of a given mass of a gas varies directly as its absolute temperature provided the pressure is kept constant”. This states that “The internal energy of a given quantity of a gas depends on the temperature”. When a gas expands without doing external work and without taking in or giving out heat. Its temperature does not change. This states that “The two specific heat at constant pressure and specific heat at constant volume of a gas do not change with the change of temperature and pressure”. This Law states that “Equal volume of different gases at the same temperature and pressure contains an equal number of molecules”.